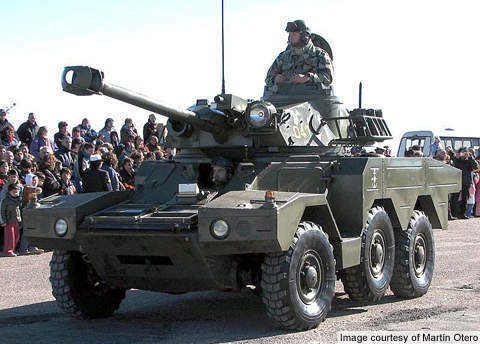 ERC 90 (Engin de Reconnaissance a Canon de 90) is a family of 6x6 wheeled armoured vehicles which was developed by Panhard General Defence for the French Army. The ERC 90 range consists of the ERC 90 Sagaie, ERC 90 Lynx, ERC 90 CMI and ERC 90 NG vehicles. 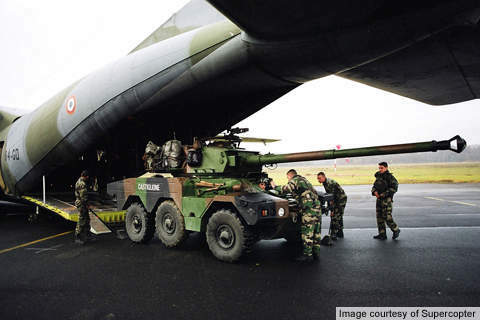 The first batch of Sagaie vehicles entered service with the French Army in 1984. The major difference between the ERC 90 variants is the type of turret fitted on each model. ERC 90 can be armed with a 90mm F1/F4 canon or Cockerill Mk3 90mm low pressure gun depending upon the turret configuration. ERC 90 (Engin de Reconnaissance à Canon de 90) is a family of 6×6 wheeled armoured vehicles which was developed by Panhard General Defence for the French Army, as well as export markets. The ERC 90 range consists of the ERC 90 Sagaie, ERC 90 Lynx, ERC 90 CMI and ERC 90 NG vehicles. The French Army evaluated the ERC 90 Sagaie during 1978-80. The vehicle was accepted in December 1980 and further trials were concluded in 1982. The first export order for 36 vehicles was placed by Argentina in 1979. Mexico ordered 42 Lynx vehicles in 1981. The first batch of Sagaie vehicles entered service with the French Army in 1984. A total of 193 Sagaie vehicles were delivered by 1990. The major difference between the ERC 90 variants is the type of turret fitted on each model. The Sagaie is armed with a 90mm gun on the two men crew TS-90 turret. The 90mm F4 canon can fire APFSDS ammunitions. 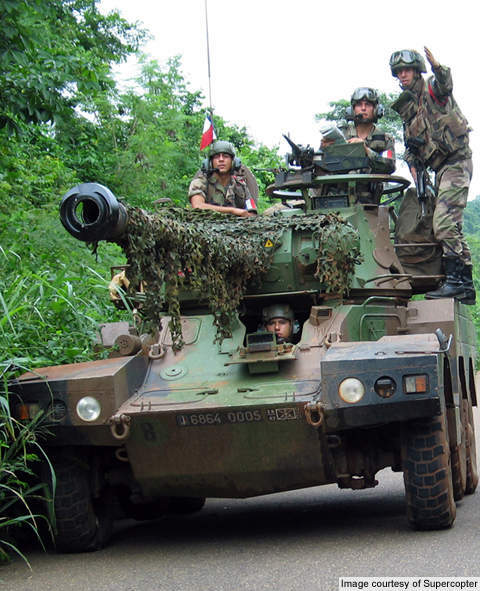 The French Army is the major operator of Sagaie. A few vehicles are also in service with armies worldwide. The Mexican Army operates approximately 120 ERC Lynx vehicles. ERC 90 CMI is fitted with a two men crew CMI CSE-90 turret mounting a 90mm gun. Panhard unveiled a new variant known as ERC 90 NG (new generation) in June 2008. The ERC 90 NG is equipped with a new power train and improvised protection system. It is offered with the TS-90 (Nexter), HS-90, CSE-90 (CMI) or 40mm CTAI turrets according to the customer requirements. "ERC 90 was developed as a successor to AML and M3 4×4 armoured vehicles." ERC 90 was developed as a successor to AML and M3 4×4 armoured vehicles. It uses many automotive components of the Panhard VCR APC. The vehicle is of all-welded steel construction. It can carry a crew of three, with the driver sitting in the front part of the hull. The turret is fitted in the centre of the vehicle. The commander and gunner are seated on the left and right sides of the turret respectively. Both are provided periscopes for all-round observation. A telescopic sight is provided for the gunner. The vehicle has an overall length of 7.6m, width of 2.5m and height of 2.3m. 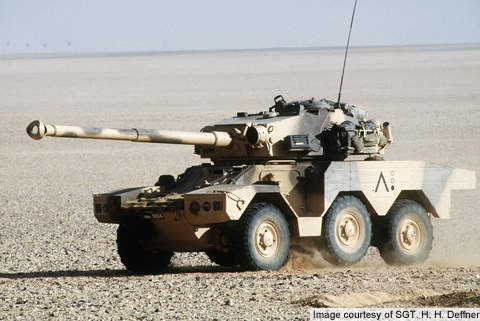 The combat weight and tare weight of the vehicle are 8.89t and 8.1t respectively. ERC 90 is optionally fitted with a nuclear, biological and chemical (NBC) system, a ground navigation system, air conditioning system and a front-mounted winch. ERC 90 can be armed with a 90mm F1/F4 canon or Cockerill Mk3 90mm low pressure gun depending upon the turret configuration. Lynx carries 21 rounds of 90mm ammunition and Sagaie carries 20 rounds of ammunition for main gun. A coaxial 7.62mm machine gun serves as a secondary weapon for the vehicle. The vehicle is also fitted with four smoke grenade launchers. The vehicle protects the occupants from small arms fire, shell splinters and mines. The V-shaped welded steel structure on the bottom deflects the force of bomb blasts and protects the floor against damage from mines. The ERC 90 NG features advanced armour protection suitable for present operational requirements. 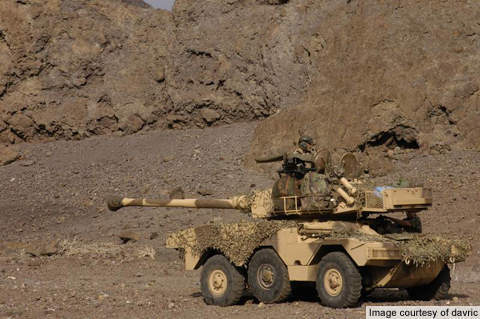 The vehicle is fitted with strengthened armour offering STANAG 4569 level 3 protection over the frontal arc and level 2 protection over other parts of the vehicle. ERC 90 is powered by 170hp MTU diesel engine replacing the older Peugeot V-6 petrol engine. The engine, coupled with an automatic Renk gearbox, delivers a maximum power of 125kW at 2,300rpm. The vehicle has a maximum speed of 95km/h and a range of 800km. ERC 90 can be deployed in almost all external operations. "ERC 90 is a family of 6×6 wheeled armoured vehicles." It demonstrates superior all-terrain capabilities and has an option to raise the centre pair of wheels to negotiate with different terrain types. The vehicle is fully amphibious without preparation and is propelled in the water by rear mounted waterjets. ERC 90 is airportable by Transall C-160 and Hercules C-130 aircraft. CMI Defence is the undisputed technological leader in multifunctional, high-power turrets for light and medium-weight armoured vehicles.